Cataract eye surgery is one of the most common (and successful) procedures performed today. At Austin Eye, our board certified eye doctors field questions regarding various aspects of the procedure, including the recovery. Many patients want to know how soon after surgery they can safely drive. Here, we discuss the answer in detail. Cataract surgery requires anesthesia, and for this reason you will not be able to drive yourself home immediately after your surgery. Instead, you will be released into the care of a loved one and they will need to drive you home so you can rest for the remainder of the day. In the past, many people opted to take a cab home, but recent regulations require that eye care facilities release patients to the care of a friend or relative. This is so that the caretaker can stay with the patient and ensure there are no post-op complications, however rare they may be. 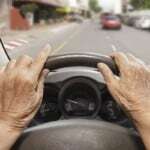 Most patients are able to resume driving 24 hours after cataract surgery. However, this completely depends on the individual patient. The day after your surgery, you will return to your surgeon’s office for a follow-up appointment. They will evaluate your vision to determine when it’s safe for you to drive and resume other normal activities. It is very important that you wait for clearance from your doctor, as some patients heal more quickly than others. It could be that your doctor recommends waiting a little while longer before driving again, just to be safe. For this reason, you should also plan on having a loved one drive you to and from your follow-up appointment. Keep in mind that you may be required to wear an eye shield for a few days after surgery to aid your healing. It may also take about a week for your vision to completely stabilize. Your eye doctors will discuss these factors, and how they may affect your ability to drive, during your in-office consultation. To learn more about cataract surgery, including whether you are an appropriate candidate for the procedure, please schedule a consultation with Austin Eye. Contact us by calling our North office at (512) 250-2020 or our Central office at (312) 454-2020 today.